Trevor Noah: Afraid Of The Dark (Netflix, 3:01 a.m.): This past Saturday, Donald Trump took a much-deserved breather from the annoying job of being leader of the free world to catch some rays in Melbourne, Florida. His rally was reportedly to get an early start on his 2020 reelection bid, or maybe it was just because his brittle ego needed a little strokin’. One of Trump’s sharpest rivals, The Daily Show host Trevor Noah, is also reminding fans of what got him the job in the first place via a new stand-up special. 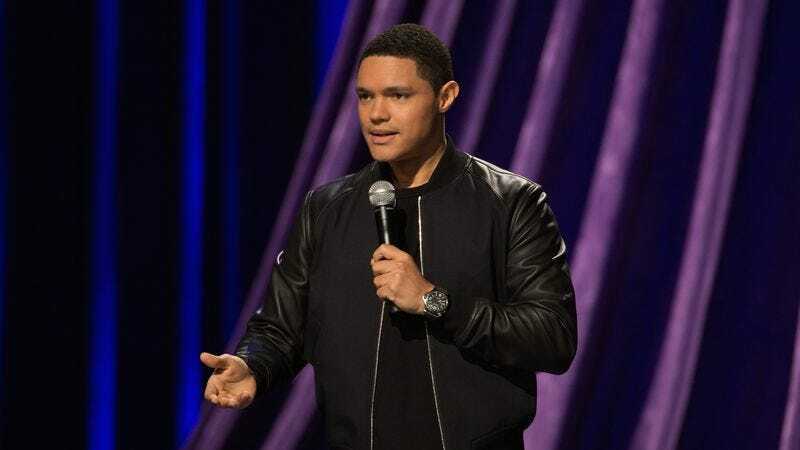 Trevor Noah: Afraid Of The Dark sees the political comic returning to his original home of the stage—specifically New York City’s Beacon Theatre—to riff on the rise of nationalism, Barack Obama, teddy bears, and probably Trump. The Flash (The CW, 8 p.m.): War For The Planet Of The Apes doesn’t hit theaters for another five months. Luckily, anyone jonesing for explosive gorilla warfare can tune in tonight to The Flash, where Barry Allen and company head to Gorilla City to rescue Harry from Grodd. But there’s a catch: Grodd will only release their friend if they help him defeat his enemy, Solovar. How will these damn dirty apes ever conquer the humans if they can’t even get along with each other? Scott Von Doviak will explore this issue of simian diplomacy and more in his review. The Mick (Fox, 8:30 p.m.): Bad news for all you Mick fans out there: We’re no longer publishing regular coverage of the show. But that doesn’t mean you can’t still watch tonight’s episode, where Mickey’s rejected suitors unite to take down her new beau. Dance Moms (Lifetime, 8 p.m.): Anyone following Dance Moms gets a double dose of reality-show poison tonight with the two-part finale “Same Old Frenemies.” This surely can’t be the first time an episode of Dance Moms has used the term “frenemies,” can it? Actually, it is. Damnit! The Detour (TBS, 10 p.m.): In the second-season premiere, Todd moves the family from Syracuse to NYC after getting a new job. According to the press release, “getting there will be way harder than it should be.” Does that mean we can expect plenty of… detours? The Pop Game (Lifetime, 10 p.m.): Essentially the pop equivalent to The Rap Game, The Pop Game follows legendary producer Timbaland “as he works with five aspiring young vocal artists, all vying to be the next big thing on the charts.” If this were airing on CBS (home of The Grammys), we’re guessing it would be combined with The Rap Game into a single series called The Urban Contemporary Game. Needles & Pins (Viceland, 10 p.m.): In the series premiere of Viceland’s exploration of the tattoo subculture, Grace Neutral heads to Vegas to delve into Sin City’s tattoo economy. A second episode (airing immediately afterward) finds Neutral flying to South Korea. Metallica: Some Kind Of Monster (Netflix): Since we recently spoke with Lars Ulrich, we’re recommending Joe Berlinger and Bruce Sinofsky’s famed rock-doc about Metallica. After all, it just plain rocks! Well, not in the traditional sense, unless watching a mega-famous metal group argue, record their worst album (okay, maybe not their worst), and hire a band therapist to work out their issues is your idea of a rocking good time.